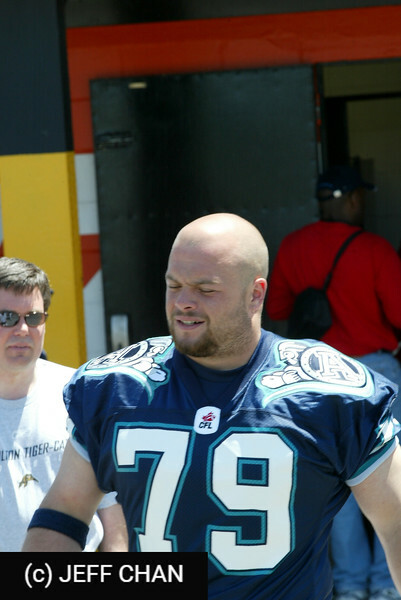 Football and Track & Field photos from Corey Trudeau's Queen's Golden Gaels career (and brief Toronto Argonauts career). Taken from us too quickly on November 24, 2014, and honoured with induction into the Queen's Football Hall of Fame on September 11, 2015..
All photos are Copyright © Jeff Chan, and may be used for personal non-commercial applications, so long as photo credits are shown or the photos are otherwise attributed to Jeff Chan. Philippe "Corey" Trudeau TRUDEAU, Philippe "Corey" - Corey was taken from us suddenly on Tuesday, November 24, 2014 but his smiles and laughter will be with us always. He is survived by his beloved wife and soul mate Louise (nee Lannan), their adored infant daughter Jacqueline and the children of his heart, Mia and Miles (Cantarutti). Dear son of Marilyn and Peter Trudeau and brother of Kirstin Thompson and her husband Hadleigh. Corey is also survived by his mother-in-law Pauline Mitchell (Robert), his step mother-in-law Jocelyne Perron (the late Frank) and his sisters-in-law Cathy (Michel), Colleen (Curtis) and Rosanne (Andrew) and many nieces and nephews whom he loved dearly. Family always came first for Corey and he was passionate about sharing his love for the outdoors, hunting, fishing, camping and hiking. Adventures always seemed to be just around the corner. A gifted athlete, a lover of ideas, an artist, a kind soul – Corey had the ability to draw others in and envelope them with his wit and love of life. Corey took great pride in his young family and friends who stood with him through difficulties and triumphs. The family will receive friends at the Township Chapel of the GORDON F. TOMPKINS FUNERAL HOMES, 435 Davis Drive (Centennial at Taylor-Kidd) , from 2-4 and 7-9pm on Monday. An ecumenical celebration of Cory’s life will be held at St. Andrew’s Presbyterian Church (Clergy & Princess Streets) on Tuesday December 2, 2014 at 11am with Reverend Dr. Andrew Johnston and Monsignor Joseph Lynch officiating. As expressions of sympathy, memorial donations to Epilepsy Kingston would be appreciated by the family.